For those who are unaware, the bad news is that I left the Spectrum scene on 4th December 2018. My work there is done. I also deleted my Twitter account and my old name has since been taken by a tragic individual who is pretending to be me. However, the good news is that I'm still supporting Multi-Platform Arcade Game Designer. I'm hoping to add the Enterprise to the editors soon, probably using the Spectrum editors for now. Acorn Atom and Dragon colour modes are also high on the list of things to do. I started to convert the Speccy version of the Editor to EP, just i take a break because of other thing. The editor is working, colours can be selected from the 256 palette too, i do not remember if i store the selected values in the right place. Load/Save should be solved, it will take longer time i think. Please inform me if you like to check the modifications, i will send you the source. Version 0.7.3 is now available here. Some bug fixes and one or two cool new features have been added since the last update and this is the first version with the Enterprise added as an option. Obviously there's more work to do but it's a start. 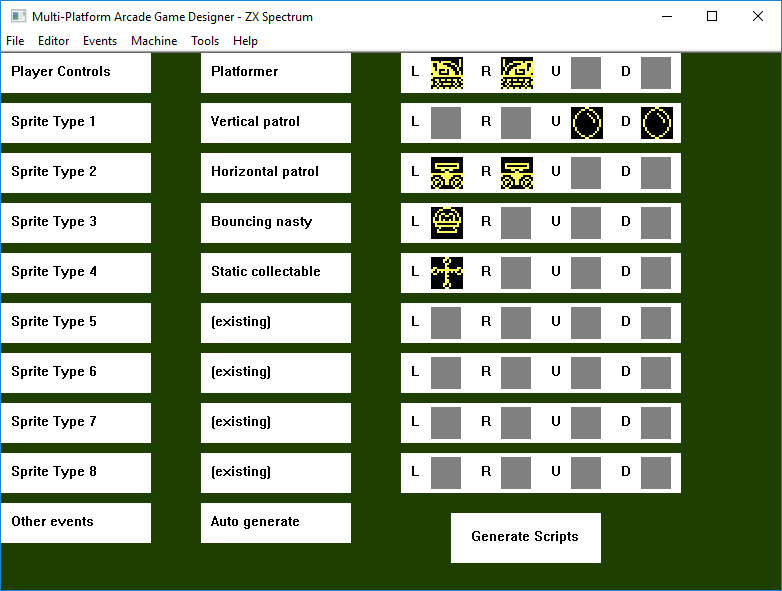 For now you can design your game for the Spectrum, Amstrad and/or Acorn Atom and convert it to the Enterprise later. Have a play with it folks and let me know what you think, I want to hear your suggestions and ideas. Very promising. I will try it, thanks. is it a windows app? wow! I always thought its specy.